It’s amazing to see the number of people who still fall for work from home scams. So many people still succumb to international scammers who make such great offers for improved life and increased income the easy and quick way that people can’t refuse unless they understand that there is no such thing as free favors in the proportions that scammers are offering. The problem is that there are so many people still searching for a way to make quick and easy money that they are ignoring all the warnings that appear in the news and articles such as this one. And, knowing that there are plenty of vulnerable entities, scammers from all around the world use the Internet to easily reach out to victiambes who are more than willing to spend a few thousand dollars to become millionaires. In general, work from home scams aim to get three things from their victims; 1) money, 2) information, and 3) assistance. The fake offers that we receive in the mailbox, email or on the phone are sometimes packaged professionally to make the offer recipients act as intended, and other times, the offers are so sloppy that one should quickly notice the scam. You’ve probably received email offers which are so poorly written that one can smell scam from afar. Most of the scams offer the chance to make easy and quick money while still in bed at home in exchange for something. The victims appear to be senior citizens, stay-at-home mothers and people with low incomes who often do not file a complaint out of embarrassment and walk away from the scam silently while accepting the losses. No matter how the scam offers are packaged, not only the victims never get paid for their work, they sometimes lose money which was demanded upfront in exchange for the work. As mentioned, the work from home scams ask for an upfront fee from their victims sometimes in thousands of dollars in exchange for the job and other promises. Other times, they indirectly ask the victambes to assist them with their scams such as buying goods with stolen credit cards, and shipping stolen goods to an address provided by scammers. 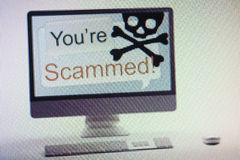 If the victim is reluctant to pay money or assist with the scams after many attempts, the scammers go after their personal information to steal their identities. One of the well known tricks is that scammers send a check to the victim for purchasing and shipping goods. These checks are obviously bad checks and because it takes a few days for banks to clear and detect the bad checks, scammers ask victims to deposit and withdraw cash from their accounts at the same time to complete the task and retain a portion of the check amount as a payment for the work well done. The problem is that by the time the banks detect the bad checks, it’s too late. The scammers have their stolen goods and the victims lose all the money they took out of their accounts to buy the goods. Although there is fraud protection available to consumers when unauthorized transactions occur, there is no protection for transactions willingly performed on behalf of a crook whether knowingly or unknowingly. Whether you suspect a scam or not, when a work from home offer is too good to be true, do some research online and investigate the company and report any work from home scams to your local, State and Federal authorities. Join our Google+ page to comment on the work from home scam article.